As soon as Gunfight at the O.K. Corral was launched I knew I wanted to write another book and make Luke and Jenny into a series. I was already off to a good start with the two kids and their mom on a road trip to Dallas, so where would they make their next stop? Lincoln, New Mexico. We've all heard stories about Billy the Kid, and many, if not most, are probably more legend than fact. As I started my research I discovered that the real story was both complex and tragic. Born Henry McCarty, I was unable to find much information about his father. His mother, Catherine, claimed to be a widow, however, I suspect she may have actually been an unwed mother. Back then record keeping wasn't as sophisticated as it is today, so it would have been easy for a young woman in her condition to simply move to another town where no one knew her and tell people she was a widow. 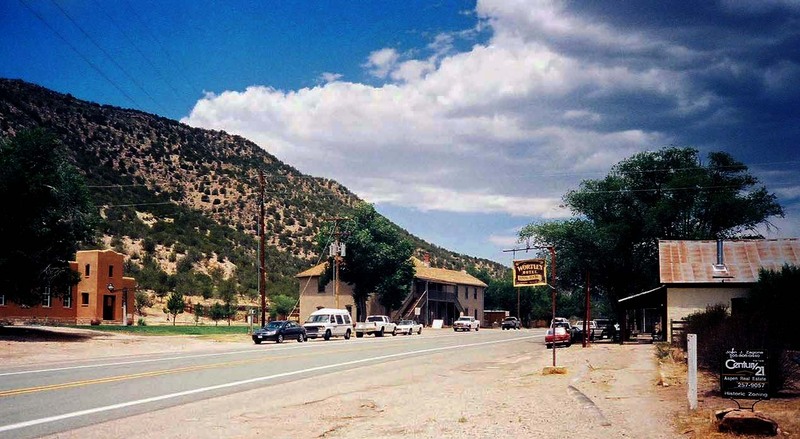 What is certain is that young Henry, later known as William Bonney and Billy the Kid, spent most of his life in New Mexico, and his story was a tale of good people trying to do the right thing who ended up vilified and persecuted by those in power. It was time to jump in the car and take a drive. Lincoln, New Mexico is about a day's drive from Tucson, Arizona, and it was a wonderful trip. New Mexico has beautiful scenery, and I really enjoyed the drive. The following day I visited Lincoln. It's been well preserved and still looks much like it did in Billy's time, with museums housing many of the historical artifacts. As a writer this was especially helpful. Not only did it give me the visual reference I needed, it gave me the opportunity to walk where Billy had once walked and to see some of the things he would have seen. Gunfight at the O.K. Corral:Luke and Jenny Visit Tombstone, was my first novel and my second book. I'd published a historic cookbook, titled, Anna's Kitchen, the year before, and was excited to try my hand at writing a novel. As mentioned in an earlier post, Luke and Jenny were inspired by the real-life kids I met doing living history storytelling performances for schools. Jenny was the first name that popped into my head for the girl, and I named her brother Luke out of homage to one of my all-time favorite storytellers, George Lucas. I think the biggest challenge for any author writing a historical novel is the research as oftentimes historians don't agree. My solution was to use several different source books from credible authors. (They're all listed in the bibliography.) Then, when the sources disagreed, I resorted to the scientific approach and flipped a coin. Another challenge was the level of violence. As I often tell people, history is not for the faint of heart. It's those violent events, such as wars, massacres, even plagues, that make into the history books. At the same time, however, I had be mindful of my readers, as the books are aimed at third through sixth grade students. This meant I had to tone the blood and gore while still maintaining the accuracy of the events I was describing. The third, and final challenge was finding the right publisher, and I found her. I met Linda Radke, of Five Star Publications, Inc., at an event in Scottsdale, Arizona. She loved the project and published the entire series, and we had a successful run. Linda was also an amazing mentor. I was a graphic designer before I became an author, and a few years later I started up my own publishing company, Good Oak Press, LLC. So when Linda finally took the series out of print I later published updated editions. The changes, however, are minor and only affect the non historical portions of the story. The historical chapters remain the same. Gunfight at the O.K. 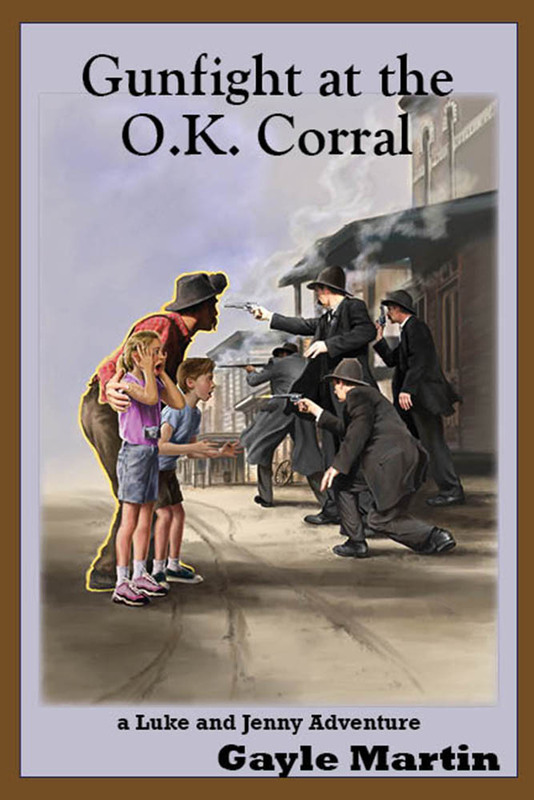 Corral:Luke and Jenny Visit Tombstone is available on Amazon and BarnesandNoble.com. 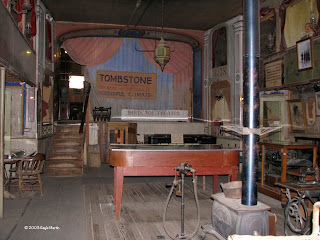 Prior to writing the Luke and Jenny books I spent a lot of time in Tombstone. Photography, like writing, is one of my passions, and long before I became involved with any of the reenacting groups in Tombstone, (a topic for a later post), I visited the town as a tourist and took many photos. Now it's no secret that Tombstone has a reputation for being a haunted town, and, sure enough, the first time I visited The Birdcage Theater I got an anomaly in my photo. This photo, (on the left), was taken in 2003, with a 35mm camera, and it also appeared in the negative. As I spent more time shooting photos in Tombstone I noticed a pattern emerging. Odd things would sometimes appear in photos taken in Tombstone, while other shots, taken in other locations, on the same roll of film, all looked normal, so think we can rule out bad film. It happened so often that in 2008 I started up a blog just for those photos. Experiences such as mine are all too common for people who live in town or are frequent visitors. In fact, they are so common that you get used to it after awhile. These experiences became the inspiration for the ghost guide characters in the Luke and Jenny books. The Swamper, featured in Gunfight at the O.K. Corral: Luke and Jenny Visit Tombstone, was inspired by an allegedly real ghost who haunts Big Nose Kate's Saloon, formerly the Grand Hotel. And while he may not have been the nicest man in real-life, he appears in the novel as a benevolent ghost who teaches the two youngers the real history of 1880s Tombstone. I realize not everyone believes in ghosts or even life after death, but those who've experienced the paranormal, ghosts are indeed real. The Luke and Jenny story goes back a little farther than I care to admit. At the time I was a docent volunteer for a historical museum in Tempe, Arizona. I later became a historical reenactor, doing costumed interpretations as an 1880s housewife in Tombstone, and I must admit, it was a lot of fun. I went to schools, visiting fourth and fifth graders, and it was a blast. 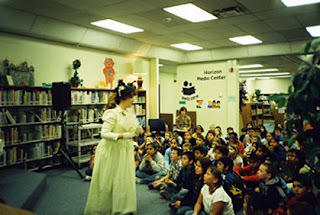 Seeing me in a period correct outfit, talking as a character, really got them excited about learning. Back I was in school, history was all about memorizing names and dates, and it was about as exciting as watching paint dry. That's not the way history should be taught. Whether it's ancient Egypt, the Renaissance, or even the American west, history is all about people and the things they did. That's why I loved performing living history. It gave students a chance to see a real-life interpretation of people living in another time. As much fun as it was, it simply wasn't possible for one person to visit every kid in every school, and that's how Luke and Jenny came into being. Luke, an eight-year-old boy, and his sister, ten-year-old Jenny, represented the kids I met during my time as a living history interpreter. However, this time around, instead of someone in a historic outfit visiting their school, Luke and Jenny would visit a real historic location, where they would meet the ghost of someone from the past. The ghost would then act as a historic guide, like I used to do. Telling stories of people from the past, the ghost guides would then take the two children on a magical journey back in time, where they would witness the real events, and learn lessons from the past that would enhance their lives in the present. The Luke and Jenny books were originally published by Five Star Publications, Inc., (now Story Monsters, Inc.), and after a successful run they were taken out of print. I put them on hiatus, and later published updated editions with my own company, Good Oak Press, LLC. So once again, Luke and Jenny can take youngsters back in time where they can meet real people from the past, and learn history in a fun and entertaining way.